Sponsors and exhibitors must use this label when having materials couriered to the venue (at least one per box). Sponsors and exhibitors must use this label when having materials collected from the venue (at least one per box). 3m x 2m Floor Space/Shell Scheme. White panel shell scheme booth. Fascia board with your company name. 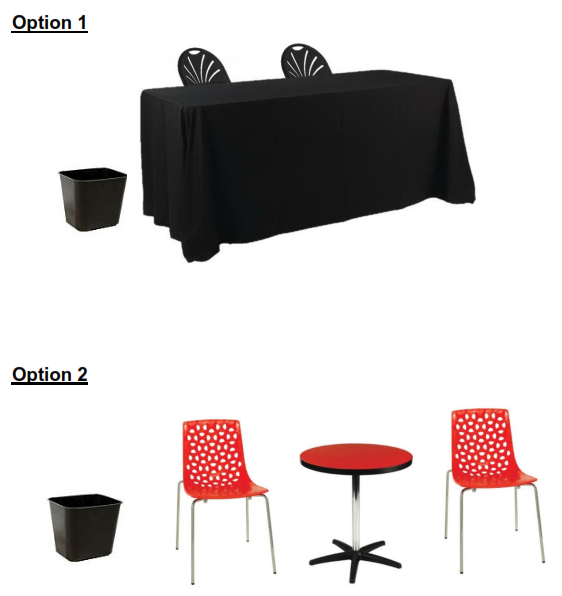 Your choice of furniture package. 1 x 4 amp power outlet. 1 x wireless internet connection per site. 1 x waste paper basket. Moreton Hire has been appointed as the exhibition supply company for eResearch 2018. To order furniture and view the Moreton Hire catalogue/manual please CLICK HERE. When booking please appoint a single point of contact within your Organisation. All bookings will be recorded under the one name and all correspondence will be sent to this person. An official name badge will be required to access the conference and exhibition areas. Anyone from your Organisation attending the conference, or guests you wish to invite, must register with Conference Design prior to the event. All company representative registrations and social functions, inclusive and/or additional, need to be booked. When arriving for Bump In on Tuesday 16 October please go straight to your stand and begin setting up. Conference staff will deliver name badges to your stand from 1:30pm. All sponsors and exhibitors will be issued QR codes as part of the 2018 App Game designed to encourage delegate flow and interaction. Exhibitors can choose to clearly display the QR code on or within your booth to avoid unnecessary interruptions or you can ‘hide’ the code to ensure interaction with your representatives. Each QR code will reveal the exhibitors’ company name. To enter the draw, participants will need to have collected all sponsor and exhibitor names. Key sponsors will also be given the first opportunity to provide prizes. If you would like to donate a prize please contact andrew@conferencedesign.com.au. All incoming items should arrive via the Receiving Bay in Queens Lane. All items are to arrive at the Receiving Bay between the hours of 0700am – 1500pm, Monday – Friday. Deliveries outside of these hours will need to be arranged prior to delivery. Deliveries can only be accepted no more than 2 working days prior to the event commencement date. Therefore deliveries are allowed for this event from Thursday 11 October 2018. Deliveries will not be accepted earlier than this date without prior arrangement. Download and use the dispatch/collection label provided above. All goods must be removed from the hotel premises or storerooms by close of business 1 working day after the conclusion of the event. Therefore all goods must be collected by the end of business on Monday 22nd October. Ribit connects innovative companies and startups to students with high-demand skills such as programming, engineering, business, communications and marketing, research and design. Ribit does this through a simple digital jobs matching platform and through physical speed-networking events. Over 22,000 students are currently registered on the platform which was developed by machine learning researchers at Data61. Students will get the chance to be face-to-face with leading eResearch employers from industry and government agencies. The event is as an excellent opportunity for students to exchange ideas, engage and connect with industry leaders and scope out future career paths. For more information and to get involved click here. We will print one logo per sponsorship package in the program book, in the conference app, on the sponsors’ slide and on the conference web site. Web and App: a high resolution PNG, JPG or TIFF image, no less than 250 KB in size. Please upload via the online booking portal when you book or email to Conference Design. Plus a contact name (where appropriate), email address, web address and phone number. Your profile will be included in the conference app. Eligible sponsors have the opportunity to have a short video linked to the eSatchel in the App. Your video will be uploaded to Vimeo and linked to the eSatchel in the app and online. Delegates will be able to view the video on their mobile devices or desktops. As this is a new option we would recommend using existing content or creating a short promotional video – to maximise views be creative! PDF advertisements will be linked to your profile in the Conference App. Please upload via the online booking portal or email to Conference Design. Due to Conference Design no later than close of business Friday 14 September 2018. Please register all representatives attending the conference no later than one month prior. Representatives should be registered for the conference and all social functions. Please register representatives via the online booking portal.